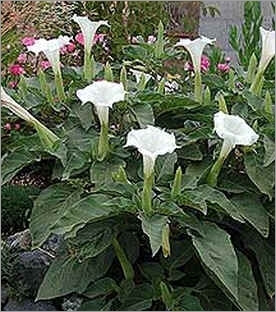 Datura metel , the Horn of plenty or the Downy thorn apple, is a member of the Soanaceae, or nightshade family. It grows 3 or 4 feet tall and origins of Central America. Normally treated as an annual, the plant can be over-wintered in a greenhouse environment. A very beautiful, very interesting looking plant. The large prolific white flowers are in upright inflorescence and burst open in profusion throughout the Summer, commonly 12-18 cm long. Very fragrant at night and a good part of the morning. The plants will start flowering when they are about a foot tall. 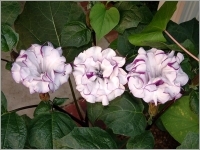 The leaves are ovate, large, dark green, 25 cm long, 20 cm wide; sometimes with purple stems. The fruit is prickly or spiny. It seeds prolifically. Remove seed pods regularly to encourage further blooms. All parts of plant are poisonous if ingested.